The best anti spam solutions for Managed Service Providers should not only meet the high expectations of your clients, but should also have a low management overhead in order to make the provision of an anti spam solution financially viable in a fiercely competitive market. Naturally, meeting the expectations of your clients has to be your first priority. In this respect, anti spam solutions for Managed Service Providers have to achieve a high rate of spam detection, protect clients´ networks from email-borne threats, and be easy for the client to manage. If clients find it easy to administer their own domains – search and release from their quarantine, create whitelists for their domain, create reports and review their own domain history – this releases Managed Service Providers from some of their management obligations. Before discussing client domain administration and management overheads, let us first look at the key element of an anti spam solution – spam detection. Different spam filters work in different ways and, to ensure your clients´ expectations are met in regard to spam detection, there is one important feature you should look for when evaluating anti spam solutions for Managed Service Providers – Greylisting. Nearly all spam filters run front end tests to compare inbound email against a Realtime Blackhole List – effectively a blacklist of IP addresses from which spam is known to originate. This comparison is good for blocking 97% of spam, but it fails to detect spam originating from new sources – which is why spam is still delivered to your clients´ inboxes. Greylisting is a process that requests emails suspected of containing spam to be resent. Spammers´ servers are too busy sending out spam emails to respond to the request, so the request is ignored and – after a predetermined period of time – the suspect email is classified as spam and quarantined. In this way, spam from previous unknown origins is blocked – increasing the spam detection rate to above 99%. In the same way that different spam filters work in different ways, many use different antivirus software – some better than others. Emails are increasingly being used by hackers and cybercriminals as a means of infiltrating a network. They rely on phishing emails to get an employee to reveal their security credentials, or include malicious links in their emails to lead an employee to a malware-infested website. Consequently, the best anti spam solutions for Managed Service Providers should include antivirus software with phishing protection and malicious URL blocking. These features not only protect your clients´ networks from being infected with malware from email-borne threats, but yours as well. Keeping your network clean of malware will positively impact your service and your business. Whereas the primary function of a spam filter is to prevent inbound spam from reaching its destination, it is also important that outbound emails are scanned for spam and viruses as well. If one of your clients was to send out an email considered to be spam, or containing malware, it could be possible that their IP address is blacklisted on a Realtime Blackhole List – potentially delaying the delivery of all their mail. Anti spam solutions for Managed Service Providers with outbound scanning avoid this scenario. Any outbound email that is identified as spam is quarantined and included in reports so that system administrators can advise the sender of the issue and have the issue resolved internally. Not all anti spam solutions for Managed Service Providers include this important feature, but it prevents a scenario that could possibly lose you a client. SpamTitan´s anti spam solutions for Managed Service providers include all the features mentioned above. We include Greylisting among our filtering mechanisms to achieve a spam detection rate of 99.97%. Dual antivirus protection is provided by Bitdefender and Clam AV, and includes phishing protection and malicious URL blocking. Plus all outbound emails are scanned to avoid accidental blacklisting on a Realtime Blackhole List. One other factor that places our anti spam solutions for Managed Service Providers ahead of the field is ease of use. Per domain administrators can be created for each hosted domain – giving your clients the ability to manage certain elements of their accounts via a web-based portal. A full suite of reports can also be set up for each domain, providing the opportunity for end user spam management and reducing your management overhead to the minimum possible. We offer our spam filtering solutions as a virtual appliance – “SpamTitan Gateway” – or as a cloud-based anti-spam service – “SpamTitan Cloud”. Both solutions support an unlimited number of domains and an unlimited number of users, with multi-level administration available. A choice of hosting options exist for our solutions – SpamTitan Cloud, a Private Cloud or hosted within your own infrastructure. Our anti spam solutions for Managed Service Providers are available in white label format with an extensive API set for integration with third party management software. SpamTitan’s pricing model allows for the flexibility required when dealing with a fluctuating number of clients – as is common when offering managed services. We believe that the features within our anti spam solutions for Managed Service Providers will allow you to offer your clients a service that meets their expectations. We also believe that the efforts we have put in to deliver a low management overhead will pay dividends for Managed Service Providers reselling our service. However, we also believe that the best way to evaluate anti spam solutions for Managed Service Providers is for service providers to test the solution in their own environment (after all, you know your clients better than we do). Consequently, we are giving all service providers the opportunity to try SpamTitan free for thirty days. To find out more about our free trial offer, call our team of Sales Technicians today. 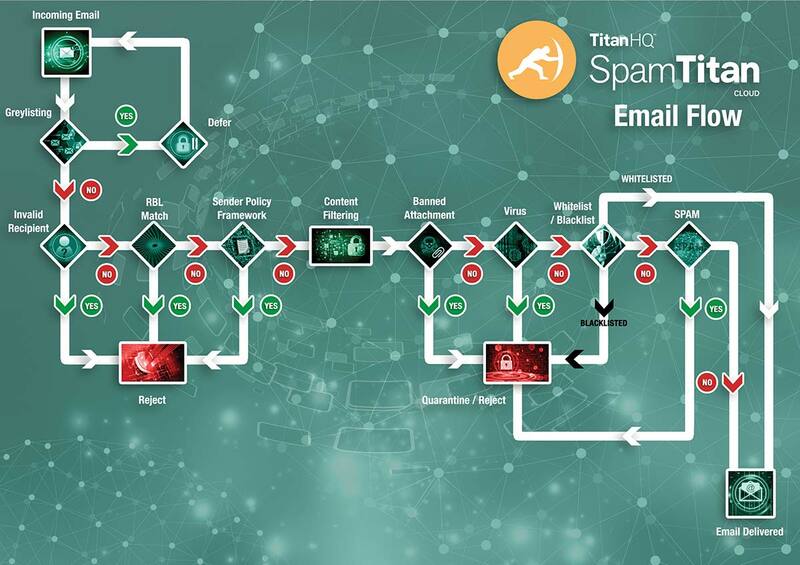 Our team will be delighted to answer any questions you may have about anti spam solutions for Managed Service Providers, and will guide you through the process of installing and configuring SpamTitan so that you can be protecting your network from hacked accounts and providing unmatched email security for your clients within minutes.